Stems: Erect or occasionally decumbent, stiff, 1-2, simple or sometimes sparingly branched, minutely hairy or nearly glabrous. Leaves: Variable, mostly opposite, occasionally some alternate, simple, nearly sessile, ascending or spreading, ovate, oblong, lanceolate or linear, 1.5 to 5.5 inches long, .25 to 2.5 inches wide, nearly glabrous or minutely hairy; margins usually wavy; tips pointed, blunt or notched. Inflorescences: Umbels, 1 to several, dense, rounded, short-stalked in upper leaf axils, 20-80-flowered. Flowers: 5-parted, about 1/2 inch tall; calyx lobes lanceolate, green to purple-tinged, minutely pubescent; corolla lobes narrowly oblong, pale green, sparingly pubescent, bent abruptly downward; hoods greenish white, tips rounded; horns absent. Fruits: Pods, broadly spindle-shaped, 3 to 6 inches long, 3/5 to 4/5 inch wide, minutely hairy or nearly glabrous, erect on downward-curved stalks; seeds egg-shaped, tufted with tan hairs at tips. Habitat: Dry sandy or rocky prairies, on limestone soils. Forage Value: Unpalatable to cattle and will increase in overgrazed pastures. Uses: Native Americans relieved sore throats by chewing the roots, gave crushed roots to their children to treat diarrhea, and used the plant to spice soups. 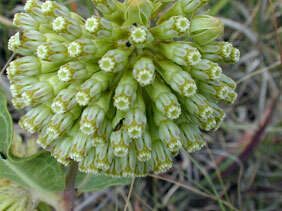 Comments: Green milkweed usually occurs as widely scattered individual plants. Formerly treated as Asclepiadaceae - Milkweed Family.